Most Germans, like the woman in this picture, shop in bulk and reuse product containers to reduce packaging waste. The 1991 Packaging Ordinance states that packaging must be made from environmentally sound materials, use minimal resources, and be easily refillable. As a result, many products are sold in two forms – one with the normal container and the other as a refill, often in bulk or with less packaging. For example, soaps can be bought in a dispenser, or in a plastic bag, which uses much less material. Often the customer pays an extra deposit for the refillable bottle that comes with the first purchase. The second section of the Packaging Ordinance outlines how a company must accept, reuse and recycle the packaging materials they manufacture after they have been used. Germany has also instituted the Green Dot Program, an example of a “polluter pays” policy. When companies pay a fee to use the Green Dot logo, they are exempted from the requirement to take back and recycle their packaging. The fee covers the extra recovery and recycling costs borne by the public. Between 1992 and 2007, the proportion of waste recycled in Germany rose from 10 percent to 40 percent. Compliance is not a large problem with recycling in Germany, however there are some problems with exporting trash to landfills in France or Eastern Europe. Dongqing Zhang et al. (2010) A Comparison of Municipal Solid Waste Management in Berlin and Singapore, Waste Management 30(5): 921–33; Cynthia Pollock Shae (1992) Getting Serious in Germany: Germans are Reducing their Output of Household Waste, EPA Journal: 50–52; and Benjamin J. Vail (2008) Illegal Transnational Shipment of Waste in the EU: Culprits and Collaborators in Germany and the Czech Republic, Environmental Politics 17(5): 828–34. Either of the women in this landscape could claim a disability in the course of their lives, if need be, to benefit from the evolving system of social welfare provisions established in Germany’s Constitution. The basic laws establishing the rights of disabled persons can be found in Book 9 of the Social Code (Neuntes Buch des Sozialgesetzbuches or SGB IX) and the Equal Opportunities for Disabled People Act (Behindertengleichstellungsgesetz or BGG). These provisions stem from a 1994 amendment to the Constitution. The historical basis of disability welfare in Germany today stems from the period after World War I, which produced large numbers of injured and disabled veterans and prompted new legislation requiring firms to employ at least one severely handicapped veteran for every fifty employees. The trajectory of this quota-based system has continued uninterrupted in German policy, save the period of The Third Reich’s reign, when treatment of people with disabilities was barbaric, with the notable exception of injured soldiers. Today, the employment quota system requires all public and private employers to fill 5 percent of their jobs with severely disabled employees. Failure to comply, which is quite common, results in monthly fines ranging from €105 to €260 paid into funds to benefit disability programs. Most discussion of disability law in Germany highlights the dramatic changes associated with the 1994 constitutional amendment, prompted by lobbying efforts modeled after those in the United States that led to the Americans with Disabilities Act. The aim of these efforts has been to integrate people with disabilities into German society as seamlessly as possible and to move away from the “parallel track approach” that previously characterized social welfare. The earlier approach was focused on separate-but-equal institutions for educational, occupational, and societal services. Martin Kock (2004) Disability Law in Germany: An Overview of Employment, Education and Access Rights, German Law Journal 5 (11):1373-92, Fiona Geist; Bernd Petermann, and Volker Windhammer (2005) Disability Law in Germany, Comparative Labor Law & Policy Journal 24 (4):563-608; Katharina Heyer (2002) The ADA on the Road: Disability Rights in Germany, Law & Social Inquiry 27 (4): 723-62; and Alison Evans Cuellar and Joshua M Wiener (2000) Can Social Insurance for Long-Term Care Work? The Experience of Germany. Health Affairs 19 (3):8-25. Maternity laws protect mother and child health during employment. The Maternity Protection Act protects the rights of employed women during pregnancy and prohibits them from participating in a variety of work-related activities during and after pregnancy. Women working from home who are not receiving any form of public health insurance are eligible to receive a maternity allowance from the Reich Insurance Code. Nursing mothers are entitled to two half-hour breaks per eight hours worked for breastfeeding. Prohibitions dictate that “expectant mothers should not do any heavy physical labor and shall not be employed in jobs where harmful effects of hazardous substances or radiation, dust, gases or vapors, or exposure to heat, cold or humidity, vibrations or noise, pose a threat.” After childbirth, women receive a minimum eights weeks paid leave, while those with premature or multiple births are prohibited from employment for up to twelve weeks (though they will receive compensation). Due to Germany’s low fertility rate in recent years, legislation has increasingly aimed to boost childbearing, not only through the generous legal parameters of the maternity leave system, but also through financial incentives like government-funded subsidies and compensation. Jochen René Thyrian et al. (2010) Changing Maternity Leave Policy: Short-term Effects on Fertility Rates and Demographic Variables in Germany, Social Science & Medicine 71(4): 672-76; Federal Ministry of Justice, Law on the Protection of the Working Mother (Gesetz zum Schutz der erwerbstätigen Mutter), January 24, 1952. Translated from German. Retrieved December 6, 2013, from Bundesministerium der Justiz: http://bundesrecht.juris.de/muschg/BJNR000690952.html#BJNR000690952BJNG000102308; and Uta Schönberg and Johannes Ludsteck, Maternity Leave Legislation, Female Labor Supply, and the Family Wage Gap, Discussion Paper No. 2699, Institute for the Study of Labor (Forschungsinstitut zur Zukunft der Arbeit), Bonn, 2007. Many citizens in Germany choose to grow food on their own property, to buy other locally sourced groceries, or to purchase labeled organic products. These activities take place in the political context of the European Novel Foods Regulation (NFR) of 1997 and the associated labeling regulations of 2000 administered by the European Union’s Directorate General of Enterprise. Domestically, the implementation of NFR is overseen by the Federal Ministry for Consumer Protection, Food, and Agriculture, which was created during a bureaucratic restructuring in January 2001. The story of Germany’s food regulatory system hinges upon the outbreak of BSE (“mad cow disease”) in 2000. Entire herds of cattle were slaughtered and the ministers of health and agriculture were forced to resign. This event shifted public attention, policymaking, and research funding away from the drive toward international competitiveness that had previously defined agri-biotechnology and toward a more precautionary approach to agriculture, promoting organic and other non-traditional farming techniques. Contributing to this shift was Germany’s early commitment to clear labeling of GM (genetically-modified)-free food in 1998, which certifies products containing no more than 0.9% of genetically modified ingredients. The associated testing takes place under the auspices of the Federal Institute for Risk Assessment and the Robert Koch Institute of the Health Ministry. These policies and institutional arrangements have been driven by consumers’ preferences for food that contributes to health and enjoyment, preservation of nature, and the welfare of animals. The strict regulation of GM methods has fostered tremendous growth in the organic market. Sheila Jasanoff, Designs on Nature: Science and Democracy in Europe and the United States, Princeton University Press, Princeton, New Jersey, 2005; Karin Boschert and Bernhard Gill (2005) Germany’s Agri-biotechnology Policy: Precaution for Choice and Alternatives, Science and Public Policy 32 (4):285-92; and Susan Baker et al. (2002) Mapping the Values Driving Organic Food Choice: Germany vs. the UK, European Journal of Marketing 38 (8):995-1012. Rules issued by the European Union and Germany’s federal government require that an increasing proportion of the energy used in homes, businesses, and public buildings comes from renewable sources. The energy flowing through the power lines in the background of this scene likely comes from partially or wholly renewable sources. Wind farming has accelerated in Germany under the liberalization of Europe’s energy markets (Directives 96/92/EC and 2003/54/EC). These directives regulate the quality, equitability, and continuity of energy supply while opening up individual member states’ markets to the entire European Union. The liberalization of the market could decrease energy prices and increase consumer options through competition, but also poses a challenge to environmentally sustainable energy sources. The concern is that profit-oriented energy suppliers will burn coal and other fossil fuels to supply market demand, contributing to global warming. To fine-tune the policies mandated by the European Union, Germany adopted rules setting the prices to promote wind and other renewables, especially in the windy northern stretches of the country. By the end of 2002, Germany was responsible for over a third of the global stock of wind energy production (as measured in megawatts of installed capacity). Over 90 percent of wind farms in Germany are owned and operated by private individuals, farmers, or cooperatives, a testament to the apparent success of combining market liberalization with national policies to regulate environmental stewardship. Shiu-Fai Wong (2005) Obliging Institutions and Industry Evolution: A Comparative Study of the German and UK Wind Energy Industries, Industry and Innovation. 12 (1):117-45; Jochen Monstadt (2007) Urban Governance and the Transition of Energy Systems: Institutional Change and Shifting Energy and Climate Policies in Berlin, International Journal of Urban and Regional Research 31 (2):326–43; and Staffan Jacobsson and Volkmar Lauber (2006) The Politics and Policy of Energy System Transformation ¬– Explaining the German Diffusion of Renewable Energy Technology, Energy Policy 34:256-76. The Federal Environment Agency (Umweltbundesamt) places hourly and daily limit values on sulfur dioxide, one of the main components of acid rain, which can harm human health and forest ecosystems throughout Germany. The levels of sulfur dioxide and other pollutants are closely monitored and the data are shared with the public in map form on the Environment Agency website. Typically the maximum daily levels of sulfur dioxide are about half the allowable limit set by the Environment Agency. Historically, acid rain has been recognized as a major problem in Europe since the 1970s, and Germany has often led the region in efforts to address the problem. According to Boehmer-Christiansen, the German response has been guided by vorsorge – the idea that “damages done to the natural world should be avoided in advance in accordance with opportunity and possibility.” German economists predicted high costs resulting from the damage caused by acid rain, justifying a large-scale retrofitting plan for German combustion plants without waiting for proof that they were the cause of the problem. As a result of this proactive approach, from 1975 to 1988 emission levels dropped by 63 percent. Because sulfur dioxide crosses national borders, abating acid rain in Germany requires the cooperation of other countries. To this end, the Helsinki Protocol was signed by 21 European nations 1987. All parties to the agreement successfully reduced emissions by 30 percent, as agreed under the treaty. The European Union updated the air quality standards with two sets of rules – Directive 2008/50/EC on ambient air quality, and Cleaner Air for Europe, which provides guidelines to all member states. Sonja Boehmer-Christiansen, The Precautionary Principle in Germany – Enabling Government, in Timothy O’Riordan and James Cameron (eds. ), Interpreting the Precautionary Principle, Earthscan Publications Ltd., London, 1994; Evan J. Ringquist and Tatiana Kostadinova (2005) Assessing the Effectiveness of International Environmental Agreements: The Case of the 1985 Helsinki Protocol, American Journal of Political Science 49(1): 86-102; Susan Rose-Ackerman, Controlling Environmental Policy, Yale University Press, New Haven, 1995; and David Popp (2006) International Innovation and Diffusion of Air Pollution Control Technologies: The Effects of NOx And SO2 Regulation in the US, Japan, And Germany, Journal of Environmental Economics and Management 51(1): 46-71. The development of land in Germany, including the forests surrounding this Bavarian village, is guided by decisions made at national, regional, and local levels. Under the Spatial Planning Act, local governments have considerable control over land use development plans within their jurisdiction, while regional governments have more power over surrounding lands and can override the requests of the municipality. Local governments must also abide by the Federal Building Code and the Federal Spatial Planning Act of 1965. The German government promotes sustainability and social equality through limits on private property that encourage shared public benefits. This concept, called “öffentliche Sachen” (public things) manifests itself in many aspects of land management and planning. The public has access to many private lands and protective reserves, with the freedom to engage in outdoor recreational activities. This promotes social equality in the enjoyment of nature, rather than limiting it to those who have the resources to buy their own land. Klaus R. Kunzmann (2001) State Planning: A German Success Story? International Planning Studies 6(2):153-66; Hanno Kube (1997) Private Property in Natural Resources and the Public Weal in German Law – Latent Similarities to the Public Trust Doctrine, Natural Resources Journal 37: 857–63; George Lefcoe (1977) The Right to Develop Land: The German and Dutch Experience, Oregon Law Review (56): 31-39; and Hyde Flippo, The German Way, McGraw Hill, 1997. The Renewable Energy Sources Act (Erneuerbare-Energien-Gesetz, EEG) and the 1991 Electricity Feed Law (Stromenspeisungsgezetz) ensure grid access for renewable energy sources. Producers of solar energy are allowed to sell their electricity for 43 cents per kilowatt hour, which allows homeowners to make a small business out of selling solar energy. Renewable energy investments are supported through tax incentives, government subsidies, and soft loans. Prices for renewable energy are guaranteed through 2024, reducing the risk for investors. According to Wüstenhagen and Bilharz, “Between 1990 and 2002, about 13,000 MW [megawatts] of new capacity have been created in Germany largely thanks to the feed-in system… further developed under the EEG.” Germany’s aggressive promotion of alternative energy has contributed to energy policy development throughout the European Union. António Cardoso Marques and José Alberto Fuinhas (2012) Are Public Policies Towards Renewables Successful? Evidence from European countries, Renewable Energy 44: 109–18 ; and Rolf Wüstenhagen and Michael Bilharz (2006) Green Energy Market Development in Germany: Effective Public Policy Emerging from Customer Demand, Energy Policy 34 (13): 1681-96. Houses such as this one can employ a new technology using compressed wood pellets from industrial waste products to provide central heating for residences. Germans looking to retrofit older heating systems or install new wood pellet boilers in their homes are encouraged to do so by rules governing the quality and safety of pellets and through generous government subsidies. With about 40 percent of European Union energy demand dedicated to heating homes (including water heaters), a switch to small-scale heating at the household level has the potential to greatly reduce fossil fuel demand. A law called DIN 51731 is the primary rule regulating wood pellets for residential use. The law sets standards for briquette shape, density, and chemical composition to ensure safe and reliable operation with minimal environmental impact from the associated emissions. Responsibility for testing and approving pellet products has been given to the German Institute for Standardization. Consumers can easily discern whether a product is considered “DIN approved” or “DIN plus,” based on the package labeling. In 2005 alone, 14,000 new pellet heating systems were installed, accounting for roughly 2 percent of all new heating system installations in Germany. This brought the total number of pellets heating systems to 44,000. Funding sources for subsidies have been exhausted in recent years, but the cost of the pellets are expected to remain constant or even fall, and are more stable than prices for oil and natural gas. Uwe Fritsche et al., IEA Bioenergy Task 40: Country Report Germany, Öko-Institut and German Biomass Research Centre, Darmstadt and Leipzig, Germany, July 2009; Anselm Brakhage et al. (2007) Integrating Policies for Renewables and Energy Efficiency: Comparing Results from Germany, Luxembourg, and Northern Ireland, ECEEE Summer Study: 61-72; and V.K. Verma, S. Bram, S., and J. De Ruyck (2009) Small Scale Biomass Heating Systems: Standards, Quality Labeling and Market Driving Factors – An EU Outlook, Biomass and Bioenergy 33 (10):1393-1402. 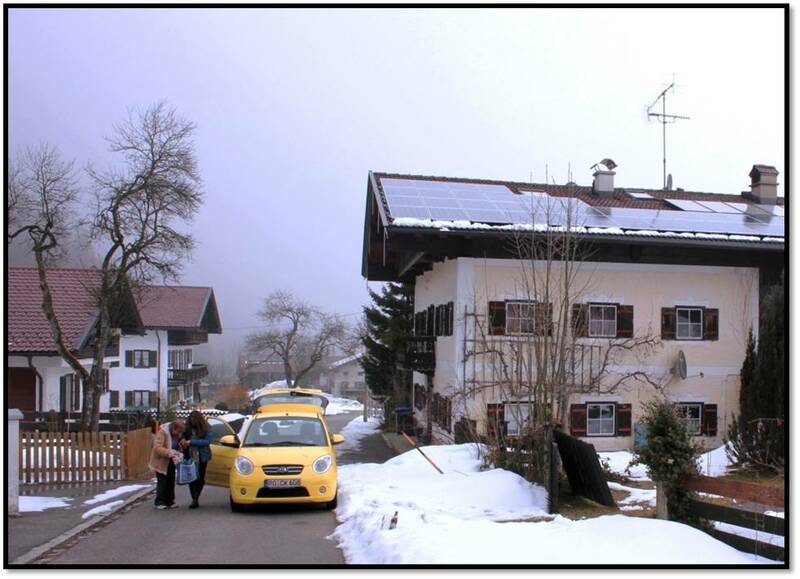 A rainwater collection system is used at this home and is common throughout Germany’s decentralized political system. A diversity of local water policies are informed by the concept of Kulturbau (literally “culture construction”), which emphasizes integrated water and land management systems. Because most water policies are made at state and municipal levels, it is difficult to pinpoint a single overarching institution responsible for the spread of rainwater collection, but the rules commonly include investment grants to promote decentralized technologies and fees to ensure that water prices accurately reflect environmental costs. Responsibility for water resource protection and management falls mainly at the Länder (state) level, which allows policies to be closely tailored to the unique environmental conditions of each region. Additionally, water supply and sewage services in Germany are not traditionally considered commercial services; this distinction removes profit motives from water utility operation. Together these conditions have fostered an environment of highly decentralized rainwater collection. More than 300 German companies specialize in water saving and recycling technology, fostering an industry that contributes 60,000 jobs to the national market. Lena Partzsch (2009) Smart Regulation for Water Innovation – The Case of Decentralized Rainwater Technology, Journal of Cleaner Production 17:985-91; R. Andreas Kraemer, Water Management and Policy in Germany, Semana Internacional de Estudos sobre Gestão de Recursos Hídricos, Foz do Iguacu, Brazil, 19-23 April 1999; and Marco Schmidt, Rainwater Harvesting for Mitigation [sic] Local and Global Warming, Fifth Urban Research Symposium, Marseille, 2009. These liberal policies were inspired in part by the experience of Nazi Germany, when media outlets were entirely government-controlled. According to Schulz et al., “Broadcasting was launched in 1923 in the Weimar Republic. However, by 1933, as Nazi Germany began its rise, broadcasting, which by that point was modeled after the very successful British Broadcasting Corporation (BBC), was nearly entirely used as a propaganda tool.” The handful of broadcasting stations set up by the National Socialists eventually formed their own network, known as ARD (Association of Public Broadcasting Corporations in the Federal Republic of Germany). In 1963, a nationwide television broadcaster, the ZDF (Zweite Deutsches Fernsehen), was established by treaty among the German states. Later ARD and ZDF teamed up to present the wide variety of programs that are available in today’s German television. Access Directive 2002/19/EC translates inter-state broadcasting and communication regulatory agreements into Federal law. In January 2000, Directive 1999/94/EC of the European Union came into force. The purpose of this social rule is to “ensure that information relating to the fuel economy and carbon dioxide emissions of new passenger cars offered for sale or lease in the Community is made available to consumers in order to enable consumers to make an informed choice.” Advertisements must display both fuel economy and carbon dioxide emissions data for the specific vehicle being promoted. The European Union has promoted emissions reductions in a number of ways. One example is the voluntary carbon dioxide reduction agreement between the European Automobile Manufacturers Association and the European Commission. The agreement has served as a model for similar initiatives in Japan and Korea. In 2009, the European Union adopted a policy requiring a gradual reduction in the average carbon dioxide emissions of passenger vehicles to 130 grams per kilometer by 2015. Georgios Fontaras and Zissis Samara (2007) A Quantitative Analysis of the European Automakers’ Voluntary Commitment to Reduce CO2 Emissions from New Passenger Cars Based on Independent Experimental Data, Energy Policy 35 (4): 2239–48; and Rüdiger Wurzel and James Connelly (eds. ), The European Union as a Leader in International Climate Change Politics, Routledge, New York, 2010.